Shanti Kiraya Bhandar, A name that stands for Good Quality, signifies High Repute Commitment & Efficient Services. Established in 1965 by Late Shri Roopchand Ji Lunia, it has sustained the growth & modernization needs to provide our clients the best-in-class. Owned by Mr. Ranu Lal Ji Lunia & Moti Lal Ji Lunia, the firm has augmented the legacy to bring the services to the levels of excellence enabling total customer satisfaction. 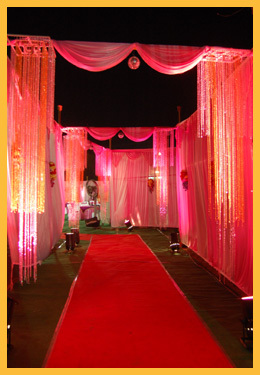 We provide bench mark services in Tents, Decorations and Allied Services at reasonable rate, with the sole motto to provide everything under "One - Roof" with best Customized Services. We endeavor to continuously provide the latest designs of Pandals, Mandaps & Stage Decorations along with other value added services like Flowers, Lights, Event Management, Balloon & Candle decorations, Seminars & conferences, Food Stalls & Dining Table Decorations, Sounds & Music and Catering. We have successfully arranged and organized so many events in private sector as well as Govt. sectors in whole Chhattisgarh. Shanti Kiraya Bhandar has successfully attained market credibility and won the heart of clients. A judicious effort of our team of qualified and experienced professionals assist us in offering unmatched quality services at industry leading prices to ensure maximum satisfaction to the customers. Our wonderful services are unique and liked by clients within and also outside Chhattisgarh. While offering these services, our professionals analyze the budget and requirements of clients in order to meet their expectation. Spread in vast areas, our sophisticated warehouses are regularly checked to maintain quality standards and remain ahead of time. We have earned a large number of prominent clients in & around Chhattisgarh, who are inspired us and have appreciated our highly attractive decoration work. Excellent Customized decoration as per client needs.